KIEV, Ukraine -- President Petro Poroshenko on Tuesday called for deploying hundreds more international monitors in eastern Ukraine after warning of growing threats to a fragile cease-fire with pro-Russia rebels there. 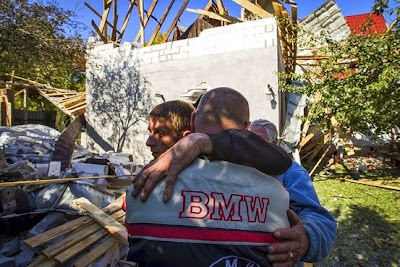 Neighbors comfort a man Tuesday in front of his house, which was damaged during recent shelling in Donetsk, eastern Ukraine. Following a phone conversation with German Chancellor Angela Merkel, Mr. Poroshenko accused the rebel groups of breaking the terms of a deal brokered by Russia that was signed a month ago in the Belarusian capital of Minsk. “The lack of steady progress in fulfilling the Minsk agreements, as well as the continuing shelling by rebels, threatens the peace plan,” he said in a statement issued by his office late Monday. Mr. Poroshenko also highlighted the importance of Kiev restoring control over the sections of the border with Russia now controlled by rebels. On Tuesday, he met with ambassadors from countries belonging to the Organization for Security and Cooperation in Europe, which has been charged with monitoring the cease-fire in eastern Ukraine. At present, the OSCE mission is expected to reach 300 monitors by the end of next week and go up to 500 soon after that, while the first two drones go into service Oct. 13. But Mr. Poroshenko appealed to the group to expand its mission to 1,500 people and 29 drone aircraft. “By our calculations, only that number of OSCE monitors, with at least 29 drones, would be able to ensure objective control” of the rebel-held territory, his office quoted him as saying. Michael Bociurkiw, spokesman for the OSCE mission in Ukraine, said any expansion of the mission beyond 500 monitors would have to be approved by OSCE members, who also would have to pledge extra money. “Also there are practical considerations: For each four monitors going to the east we need one armored vehicle and they are difficult to procure,” he said. Though the intensity of the violence has declined since the Minsk deal, fighting continues on a daily basis, especially around the airport in Donetsk, one of Kiev’s last outposts in a city that is otherwise a rebel stronghold. Ukrainian security spokesman Col. Andriy Lysenko said talks were under way “at the highest level” to save the cease-fire, but he declined to elaborate. He said five Ukrainian soldiers had been killed over the past 24 hours, while Donetsk city administrators reported four civilians died overnight. Col. Lysenko blamed the rebels for continued attacks. “Ukrainian forces opened fire in response,” he said. Rebel leaders say Kiev’s forces are mounting attacks. The ministry charged that the circumstances of the death last week of a senior International Red Cross official during shelling in Donetsk were being covered up. Moscow has blamed Ukrainian forces for the shelling, noting that the Red Cross office was in rebel-held territory. Kiev denies involvement and has blamed the separatists. The OSCE has been unable to carry out its monitoring mission because of the continuing violence and limited personnel, officials say. France and Germany have discussed the possibility of sending troops to help the OSCE, but no agreement has been reached. Rebels have said they oppose the deployment of any European forces. In Kiev, meanwhile, parliament on Tuesday gave initial approval to a package of laws aimed at curbing corruption—widely seen as one of Ukraine’s most serious problems and a major issue in the parliamentary elections set for Oct. 26. The plan, backed by Mr. Poroshenko, passed in a tumultuous session. It includes laws mandating that officials in government, the judiciary and police, as well as their families, disclose their wealth and assets, as well as major financial transactions. “Passing this packet of anticorruption laws…will give Ukraine a chance to set out on the path of a real fight against corruption,” Prime Minister Arseniy Yatsenyuk told parliament before the vote.